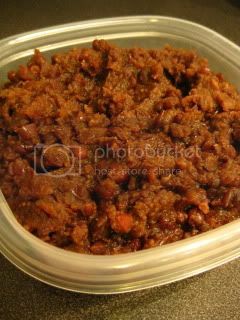 I made some sweet azuki paste to use for my dessert. We call it "Anko" in Japanese. 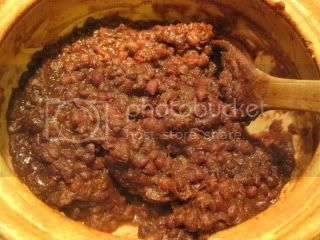 The coarse-paste anko is called "tsubu-an", and fine paste is called "koshi-an". I normally prefer "tsubu-an" for the texture, and it's also easy to make. 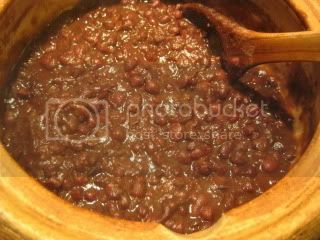 The perfect cooking tool for azuki paste is my soup & stew donabe, "Miso-shiru Nabe", because it has the thick body and works perfect for slow simmering of the beans for the nice soft texture. 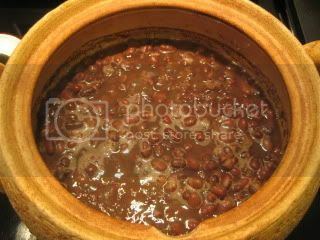 After the initial blanching (15-20 minutes), the water was changed and the beans were simmered (uncovered) for over 1 hour. The sugar was added and simmered more. Then, a small amount of sea salt was added and continued to simmer until the beans became to nice paste. So nice. My version is less sweet, so it doesn't overkill your palate by eating a pile of it. I'm going to serve it with my matcha (green tea) ice cream. You can find the recipe on toiro's website. So, please check it out.